42% of schools have cancelled recess activities at their school. Only 1 in 5 of today’s youth obtain the recommended 60 minutes or more of play each day. Recess Cleveland would like to host over 10 pop up recess events in Cleveland schools during the 2018-2019 school year. Schools that are awarded a free visit from Recess Cleveland will be selected through public vote and sponsorships. Funds raised during this crowdfunding campaign will go towards purchasing new equipment and staffing costs. UPDATE 10/5/18 – We raised $3060 to fund most of the play equipment. This is crowdfunding campaign Round 2. Purchase of Required Play Equipment for Human Bowling, Zorb Racing, and several other New Games! Promotional Materials, T-Shirts for Staff, Volunteers and Participants. Recess Cleveland is part of the Re-Inspire Foundation, a 501(c)(3) non-profit organization. All donations to Recess Cleveland made in the US are tax-deductible. Teaming up with other charities to provide fun, physical activities at their fundraising events. Recess Cleveland is moving into neighborhood schools, offering nearly 75 pop-up events at locations throughout the Cleveland Metropolitan School District and North East Ohio this year. Your support has allowed us to begin offering our services for private events like company appreciation days, birthday parties and community festivals. 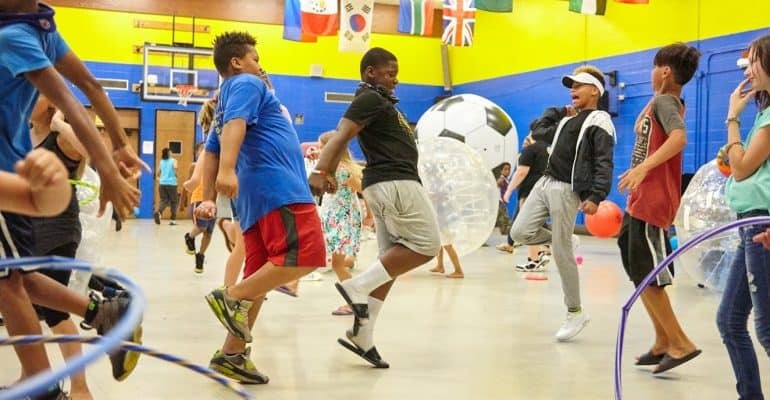 Your donation to Recess Cleveland directly supports our mission of bringing families and community members together promoting physical activity and the development of positive emotional and social skills in areas of the city that lack positive recreational environments. We’ll have contests, team games and individual activities for people of all ages and abilities! Donated funds help us offer snacks and refreshments at our events – the more donors we have, the more fun and support we can provide! Social Impact: Research shows there is a direct correlation between physical activity and an overall positive, healthy lifestyle. Unfortunately, there is also a direct correlation between impoverished neighborhoods, minorities and a lack of options for physical activity. Only 61% of African-American students get recess at school as compared to nearly 85% of white students. Neighborhoods with high rates of minorities and low incomes are the least likely to have resources to provide physical activity to its residents. Recess Cleveland changes all that. Jarrett, O. A Research-Based Case For Recess. www.usplaycoalition.clemson.edu November 2013.